Layo & Bushwacka! 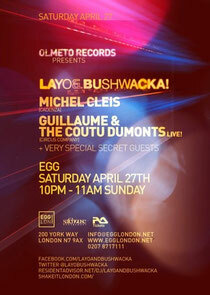 recently announced details of the second Olmeto Records party of 2013 with Cadenza mainstay Michel Cleis, and Circus Company troupe Guillaume & The Contu Dumonts (Live) joining them at The Egg on April 27 for a 11-hour event. Swiss super-star Michel Cleis needs no introduction, having established himself in house music and is famed for huge hits such as ‘La Mezcla’, which was hammered across clubland. Canadian crew Guillaume & The Contu Dumonts also perform their inimitable live show, which sits somewhere in-between the sultry allure of jazz, the unquestioned groove of house, and the propulsion of techno.